Service Costs > How Much Does It Cost to Rent a Bounce House? Bounce houses, an inflatable structure used for jumping, are often seen at birthday parties, family events, or any other get together that involves children who need to be entertained. A bounce house can range in size and design. For example, there are small bounce houses that are designed to hold two to five toddlers at a time, while a medium-sized bounce house could hold up to 12 children at once. The price to rent a bounce house will depend on the size, the length you need it for and who you’re renting the bounce house from. To rent a basic bounce house for the afternoon, from the quotes we researched, plan on spending anywhere from $75 to $200 for the day. Depending on the company, this will be for four to six hours. On some occasions, the company may charge by the hour, with rates ranging from $35 to $75+ per hour. Now, if you wanted a bounce house that’s much more than just a “bounce house,” then the costs could be closer to $200 to $450 per day. These bounce houses can often be equipped with the normal jumping areas, along with an inflatable slide, climbing walls and/or a splash area. Bouncy Bouncy Inflatables, a rental company based in Arizona, has a handful of themed bouncy houses listed on their official website, ranging from characters to a sports theme. Here, depending on the theme, could cost $100 to $225+ for a six-hour period to have it delivered; however, if you were to pick it up, it could be as little as $75. FunBouncers.net, a rental company located in Ohio, for example, charges $199 for a daily rental. If you want to buy a bounce house, the cost of one can be anywhere from $65 to $300 for a kiddie one. Keep in mind that this is not the price for the commercial sized bounce house that you are accustomed to seeing at a rental company. The smaller the bounce house is, the less you will have to pay. For instance, the Blast Zone Little Bopper retails for $155 to $250, while the Intex Playhouse retails for $60 to $80. Commercial-sized bounce houses can range anywhere from $2,000 to as much as $8,000 to purchase. If you are at an establishment that has a bounce house, you may be able to play in it for a small charge. Most places will charge $3 to $5 to play for a set time. A commercial grade bounce house, which is usually rented out, is usually 15 feet wide and is made of a reinforced vinyl that is prone to rips or tears. 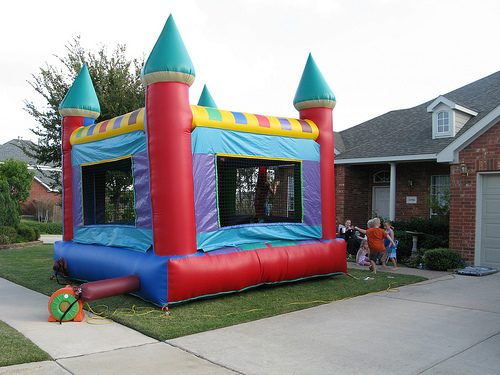 Most bounce houses can only hold upwards of 600 to 900 pounds. When you rent a bounce house, they will include everything from the stakes to the blower and straps and will ask that you sign a contract and place a deposit to secure your date. These companies, unless they notify you, will have an attendant monitor the bounce house the entire time, making sure everyone is playing according to the rules. The estimates mentioned above will also include the delivery, setup, and takedown. With a rental company, the renter will have a set time for rental. If you go over the time limit, it can result in additional charges, which is usually charged by the hour. If you live outside of their area, additional mileage surcharges can be applied to the bill. This is often applied if you live 20 to 30 miles outside of their radius. Most of the time, if the company does charge this surcharge, will be less than $50. Many rental companies can throw in add-ons that work with the bounce house. These can include a bounce house slide, playground setup or even a ball pit. Each additional item can cost anywhere from $45 to $200 per piece, per day. However, if you were to bundle the items together, you could receive a discount. A cleaning fee could apply if the bounce house were damaged during the rental period. An attendant may not be provided by some companies, but for a small fee, usually around $25 to $45 per hour, they can be upon request. Cancellation fees often incur if you cancel within 48 hours. If the bounce house isn’t near a power outlet, then you may have to rent a generator for the day. A generator, on average, can cost $75 to $175 per day, depending on how long it will be used. Permits are sometimes required if you set up in a public setting. Some bounce house setups will offer a dual-sided obstacle course through which people can race. Some will have a ladder that can be climbed to the top of a slide. There are inflatable activities such as life-size twister, bull-riding, boxing, and others. Most bounce houses will require a large grassy area that is usually, at a minimum, 20′ x 20′ in size. If you do not have the adequate space, they may not be able to install or set it up properly. Keep in mind that a bouncy house is not guaranteed. If the weather is bad, they probably will not set it up. ALWAYS make sure that the company has some sort of liability insurance. That way, if problems do arise, you will know that you are covered. All bounce houses are not created equally. If you have younger children, try to see if they have smaller sizes that can cater to them. If setting up in a public setting, always get permission before doing so as most require either a permit and/or permission before doing so. With anything, be sure to compare prices with at least three to five companies. By doing so, you should be able to get an instant quote over the phone. Most companies will have prices listed right on their official website. Check out daily discount websites such as Groupon to see if any deals exist in your area.